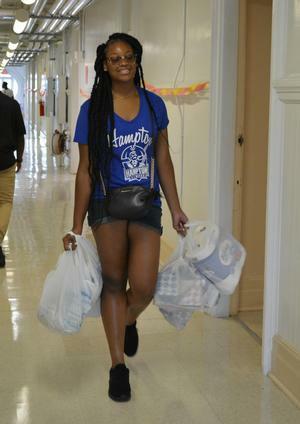 HAMPTON, Va. (August 18, 2018) — Clothes, shoes, mirrors, bedding, boxes of packaged soup, and more littered the halls and dorm rooms at Hampton University as parents, aunts, uncles, and siblings helped new freshmen students get set up in their home for the next year during the two-day freshman move-in. Several organizations from all over Hampton University's campus were available to help move the new students’ belongings straight into their rooms for them. It was a time for meeting new roommates, Resident Advisors, and getting to know the campus where they chose to begin the next adventure in their lives. Xavier Gray from Atlanta, who is majoring in childhood education, chose to attend Hampton University, “because of the location, the campus, and it has exactly what I’m looking for in a college,” he said. Another new student brought his entire family with him from Maryland. “I’m looking forward to meeting new people, seeing new faces, and beginning my new life,” said Montego Felix, new freshman business major. Montego’s father, Darron, is excited for his son to be a Hamptonian. “I’m looking forward to him having new experiences, new challenges, his next steps in life and him focusing and having a chance to be on his own and making sure it’s getting done, you know, getting to the next level,” he said. Amaya Pratt, incoming freshman chose psychology as her major. “I want to help autistic kids express their emotions so I chose psychology and maybe a minor in music and help the kids through music,” she said. “I’m really excited about meeting new people who are like me, that think like me and that are open to change and different perspectives,” said Ayjah Johnson from Hopewell, Va.
Jordan McKinney, Hampton University senior, political science major, and Hampton University Student Government Association President, was walking around Harkness Hall, helping out when needed. “Move-in is going great, it’s great to see the new freshmen coming in, we’re welcoming them into their ‘Home by the Sea.’ We have different organizations here helping out, and it’s just a great experience here today.” He also handed out advice to new students. “Take it all in, don’t feel like you need to rush or compare yourself to anybody else. We are all in this Hampton journey individually, and although we’re all one family as Hamptonians, we have our own individual paths, so with that, don’t feel like you need to fit some mold, because there’s no one mold here. It’s just a great time to take advantage and enjoy everything this campus has to offer," McKinney said. Reghan Pullins from Michigan visited Hampton University twice before and has known for a long time she would become a Hamptonian. “Hampton University was the only place I felt like I was at home so that was important,” she said. “I’m looking forward to making new friends, and checking out organizations like the choir and maybe Ebony Fire.” Reghan’s mother, Ebony Pullins-Govantes, was in her daughter's dorm room putting together shelves and making sure she would be set after she leaves at the end of the weekend. She also left her daughter some great advice. “Stay focused, enjoy this time, stay true to yourself, make sure you get them grades and bring us home a degree," Pullins-Govantes said.